The Italian Neorealist movement gained prominence following the Second World War, while Italy was dealing with the aftermath of German occupation and the tribulations of reconstruction. Prior to 1943, Italian films were primarily studio productions similar to the melodramatic output of Hollywood in the same period. However, with the fall of Mussolini in 1943, the Neorealist movement brought forth films that mirrored the harsh and unromantic realities of the average citizen, a marked contrast to the ostentatious productions that preceded them. Similar to the declaration 'Dogme 95' that was signed by Danish directors Lars von Trier and Thomas Vinterberg, Neorealist filmmakers sought to see the world through a new set of eyes. Narratively, the films of this period focused on the real-life experiences and social problems of Italy's post-war society. Similarly, these films were also populated by working class characters who were often played by non-professional actors. To further maintain the 'illusion of reality', Neorealist directors favored on-location shooting (as opposed to working in studios) and used minimal editing, which often resulted in the use of long takes. And while sociopolitical forces played a large part in paving the way for the rise of the Neorealist movement, simple economics also played an important role, with the dearth of money, production equipment, and high-quality film in post-war Italy. The first identifiable Neorealist director was Roberto Rossellini, who directed "Open City" in 1945. This was then followed by a number of other well-regarded classics in the Neorealist era of Italian cinema, including the Oscar-winning works of Vittorio De Sica, 1947's "Shoeshine" and 1949's "The Bicycle Thief". However, students of film will often point to yet another director of the Neorealist movement, whose accolades are equally impressive-- Federico Fellini, who began his film career co-writing the script of "Open City" with Rossellini. The films of Federico Fellini had their foundation in the Neorealist movement, with their profoundly personal narratives and simple technical credits. However, Fellini also brought a surreal quality to his films, infusing some 'magic escapism' into the normally staid atmosphere of the period's offerings. His first film, 1950's "Variety Lights", told the story of a girl struggling to become a star by joining a theater. "White Sheik", his follow-up effort in 1952, had a woman fall in love with an actor, unable to distinguish the difference between the actor's on-screen and off-screen personas. 1954's "La Strada", often recognized as Fellini's landmark film, was a road film involving a young girl, a circus strongman, and an acrobat. 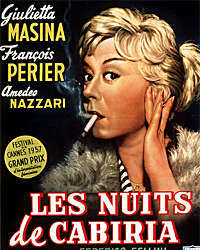 The next effort, "Nights of Cabiria", is one of Fellini's 'lost' masterpieces. Though it earned the director the Oscar for the best foreign picture in 1957, and its actress the best actress award at Cannes, it sank into obscurity not long after achieving global success, dwarfed by Fellini's later achievements, such as "8 1/2", "La Dolce Vita" and "Amarcord". With very few prints available, and a number of them showing their age, "Nights of Cabiria" has remained largely unknown. That is, until 1998, when a restored 35mm print of the film with retranslated subtitles was released, returning this forgotten film back to the big screen. In addition to the painstaking frame-by-frame restoration, a seven-minute sequence that had been removed was also reinserted. After the original cut of the film was screened, the Catholic church objected to a scene featuring a man providing food to cave-dwelling homeless, as it implied that the church had not been diligent in its efforts to help the poor. Unfortunately, this cut led to an important gap in the development of the film's main character, and the reinsertion of this footage restores this missing piece. The protagonist of the film is Cabiria (played by Fellini's wife Giulietta Masina), a scrappy and tough-talking streetwalker whose seemingly tough exterior hides her emotional insecurity. Her source of pride is the one-room house (actually more like a cement shack) that she owns amidst an industrial wasteland on the outskirts of Rome. At the beginning of the film, she has just been pushed into the river after having been robbed by her latest beau. And though she is incensed by the betrayal, she manages to pick herself up from this latest setback with the firm belief that there is someone somewhere who she will fall in love with and live happily ever after. However, in the mean time, she finds solace that she owns her own house, which essentially makes her self-sufficient and serves as a defense against the pain of emotional involvement. The story then unfolds as a series of episodic vignettes, accounting for Cabiria's travels during her search for happiness. One night, she is taken to a swank nightclub by a womanizing movie star (Amedeo Nazzari) and ends up in his well-appointed mansion. However, Cabiria quickly realizes, as she does throughout the film, that the life of privilege has no room for the likes of her. A few days later, Cabiria accompanies her streetwise associates on a pilgrimage to a shrine where they can beg the Blessed Virgin to change their lives and ease their suffering. However, seeing the pilgrimage for what it is, Cabiria finds prayer a hollow exercise, as change can only come from within. Another night sees Cabiria participating in a hypnotist's stage act and inadvertently baring her purity and innocence to a crowd of boorish strangers. And though she feels violated for having shared her private aspirations for true love, this is soon remedied when a member of the audience, an unassuming accountant named Oscar (Francois Perier), steps forward with a seemingly sincere declaration of love for her. As their courtship begins in earnest, it seems that Cabiria's lifelong suffering is about to end. But on the other hand, knowing that trust is Cabiria's greatest weakness, the audience cannot help but feel a creeping sense of despair for her. Masina's portrayal of Cabiria is a mixture of Chaplin's Little Tramp and Lucille Ball. On the one hand, she exudes a comic presence in every scene with her graceless and swaggering gait and flighty facial expressions. On the other hand, she also brings an unconquerable joie de vivre to Cabiria actions, whether it be mamboing on the spur of the moment, or trying her best to blend in to a 'fish out of water' situation. Masina's performance also masterfully handles Cabiria's subtle character transformation, with the quick-tempered and childlike demeanor gradually giving way to a softer, more compassionate, and more mature one. This is most apparent in the film's closing moments. Though the last scene is decidedly grim, it is also a showcase for the actress' ability to convey both the pain of loss and the indomitable hope that resides in all of us. Appropriate to Fellini's Neorealist roots is the use of juxtaposition between Cabiria's destitute reality and the unattainable opulence around her. 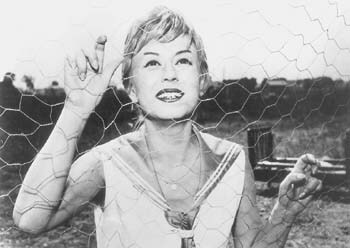 Fellini constantly contrasts his ratty-looking protagonist with the bold and beautiful faces of the economic elite, illustrating the disparity between Cabiria's humanity and the bland indifference of the rich. Those of you familiar with Fellini's later films may find a sense of déja vu upon viewing "Nights of Cabiria". First, many aspects of this film were reused when Fellini made "La Dolce Vita" three years later-- a nightclub scene with exotic dancers, a scene revolving around the Virgin Mary, and a central character who has lost hope in changing their life. Furthermore, the prototypical visual flourishes that Fellini places in all of his films are also found here, including a stone house near the sea, and the emphasis placed on a religious procession. And while the technical aspects may seem dated by modern standards, "Nights of Cabiria" still manages to resonate today. Though it has been forgotten amidst the director's other works, it was the last film Fellini made that stayed true to the Neorealist doctrine-- all his subsequent films exhibited a much greater visual autonomy. Finally, "Nights of Cabiria" shines for its deeply personal perspective-- at the heart of this film is one woman's fierce struggle to free herself from the relative safety of self-imposed isolation, and her inadvertent self-discovery of the courage that lies within. Images courtesy of Red Sky Entertainment. All rights reserved.